That certain week that happens every year when the shine of being the oldest kids in the school wears off, suddenly a handful of them are taller than their teachers, their compasses are pointed towards high school (for better or for worse depending on whether the prospect fills you with excitement or fear - but both manifest poorly) and they go off the boil...it happened. In the fourth week of term. Three weeks early to my way of thinking. So what's a Scripture teacher to do? Four things. Firstly, thank God for the two and nearly a half terms of great teaching time before it all got hard. Secondly pray for the children and their class teachers - both need prayer at this point. 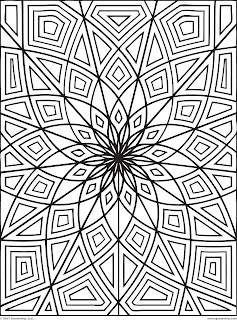 Thirdly, pull out that intensely complicated geometric colouring in sheet that has been waiting in the wings all year just for this moment. I chose something like this...but FAR more complicated. The kids went off the boil two weeks ago. Not good. Especially as I wasn't expecting it that particular day. 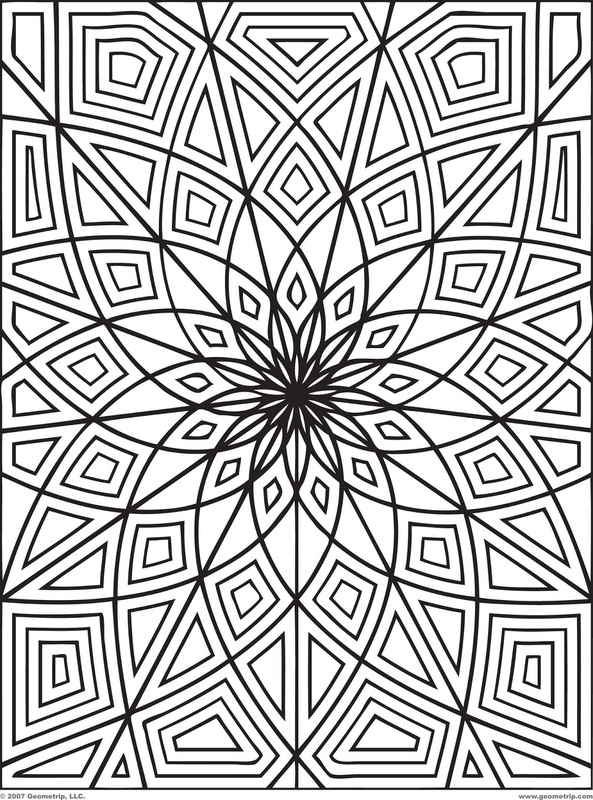 So last week I pulled out my colouring pages. "You colour this while I tell you today's story...and no two adjoining spaces are to be the same colour." Met with shock and horror. "That's right. But if you trust me on this one and do it in this kind of detail the pictures will look absolutely amazing when you are done. And by the way, there is no rush. Unlike so many other things I do when I am in your classroom, this isn't a race." Last week went supremely well and I figure I have secured two or three more lessons of peace because all of the classes were told, in front of their classroom teachers, that the pictures were only allowed out of their trays for Scripture classes. After that there are the last few lessons in the book - how the Bible fits together, the Ten Commandments and a lesson on prayer - all of which I LOVE teaching. And then the Christmas lessons which are all sorts of fun. I think we should be OK for the year. And then the fourth thing for a Scripture teacher to do? Keep praying that the gospel seeds that are being sown in classrooms here and elsewhere will at some point take root, grow and flourish. This is good work. My blogging buddy Amy put this quote from Spurgeon on Facebook this weekend. The more you read the Bible, and the more you meditate upon it, the more you will be astonished with it. He who is but a casual reader of the Bible, does not know the height, the depth, the length and breadth of the mighty meanings contained in its pages. There are certain times when I discover a new vein of thought, and I put my hand to my head and say in astonishment, "Oh, it is wonderful. I never saw this before in the Scriptures." You will find the Scriptures enlarge as you enter them; the more you study them the less you will appear to know of them, for they widen out as we approach them. Charles Spurgeon, in his sermon "Christ our Passover"
Thanks Amy. A great encouragement. You may have noticed that I have been thinking about the nature of encouragement lately. Last Friday evening we found ourselves with a bit of a situation on our hands. Not overly serious in the end, but it added a layer of emotion and the need for even greater feats of juggling to an already complicated and oversubscribed weekend. Just before my head hit the pillow at the late end of that day I received a text message from a sweet, sweet friend who had become aware of said situation. She simply said that she, her husband and her mother had prayed for this situation and then she wished us good night. Perfect timing. At the end of a long day. Just prior to sleep before the beginning of what was looking like a near impossible day ahead. And not with the promise to pray, but passing on the message that the prayer had already been prayed. Perfect, perfect encouragement. Stumped as to how to encourage someone? Too time poor to cook meals for someone or write a carefully worded note? Too resource poor to provide someone with a few days break away? Too skills-poor to fix that person's garden, finish their home renovation gone wrong or make their car work again? Sometimes an act of encouragement might seem very small - but it might end up being the grandest of all gestures. That short text with the prayer behind it spurred me on all weekend. And thanks be to God the situation is by and large resolved. "Pilate had a notice prepared and fastened to the cross. It read: JESUS OF NAZARETH, THE KING OF THE JEWS. Many of the Jews read this sign, for the place where Jesus was crucified was near the city, and the sign was written in Aramaic, Latin and Greek." "The highly respected German scholar Adolf Harnack calculated that by A.D. 250 no less than 30,000 Christians lived in Rome. Most of these came from the poorer classes. We know this because for more than a century Christians in Rome spoke Greek, the language of slaves and poor men. True Romans of the upper classes used Latin." Aramaic/Hebrew - the language of religion. Greek- the language of culture and thought. Latin - the language of government, law and institutions. Just in case you ever wondered why Pilate wrote his sign in three languages. 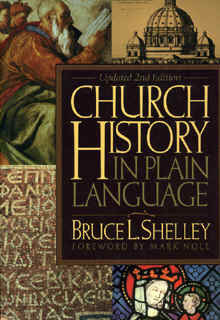 The first time I read through an overview of the history of the church (2000 years thus far) my overwhelming thought was, "It is a miracle that the church has survived." As much as the church has been carried along, under God, by faithful men and women, so also have other men and women done their best to see its undoing. Were the church a human construct, it simply wouldn't have survived. The church is truly God's church. To read church history is to see evidence that God is sovereign. And that is a great blessing. Praise be to God. Also reading: Emma by Jane Austen. My fourth Austen for the year. For times when I want something light for a chapter or two. It's unusual for me to have two books on the go at once. But it seems to be working at the moment. "The Lord is in his holy temple; let all the earth keep silence before him." Habakkuk 2:20. There hasn't been enough keeping silence before the Lord lately. "In 1657 the inhabitants of the London parish of St Dunstan’s in the West prosecuted one James Farr ‘for making and selling of a drink called 'coffee', whereby in making the same he annoyeth his neighbours by evil smells". Discovered: that when Google took away Google Reader (which was actually well before 1st July in my neck of cyberspace) they didn't take away my reading list. I thought that would go too and that I would lose the links to the blogs I like. So I put all the links into an old fashioned "Favourites" list, just in case Feedly didn't come through with the goods, and found that the reading list remains. Good news. Enjoying: a new twist on gravy that I learned from Recipes+. You dice half an onion into absolute tiny-ness and sauté it. When done add a teaspoon or two of balsamic vinegar. Then (and the purists should turn away for this next bit) blend in three tablespoons of gravy powder and the required amount of water. And there you have it. Very delicious gravy with a tang. Also enjoying: the season of lemons. Lots of friends with lots of lemon trees = lots of lemons. I squeeze them and freeze the juice in individual iceblocks - enough for hot lemon drinks in the winter and cold lemon drinks in the summer. People keep asking me, "Are you sure you want some more lemons? Don't take them if you really don't want them." Truly, there can never be too many lemons. Enjoying the profits of a friend's grapefruit tree at the moment too. Off: to squeeze a few more lemons, make a cup of tea and think about what's coming up this month. How is August looking for you?